Next on The Scoop: What Are the Best (and Worst) Aspects of Cat Vaccines? It's part trial and error, and it won't be perfect every time; here are 9 steps to help you. With a long lifespan comes complications that are a normal part of life. Things break down. For some, things break more than for others. This is true for people just as much as it is for cats. A dislocated hip, pancreatitis, dental disease, kidney disease, arthritis, basal cell cancer, anemia, ataxia — these are just some of the issues our cat Zack has battled with and beaten during his two decades of life. Instead of giving up, we always search for ways to improve his quality of life and make things easier for him. For Zack, one of the things that has eased the complications and given him resilience is our giving him subcutaneous fluids. Giving subcutaneous fluids (also called SubQ or SC fluids) is simply a way to rehydrate your cat. 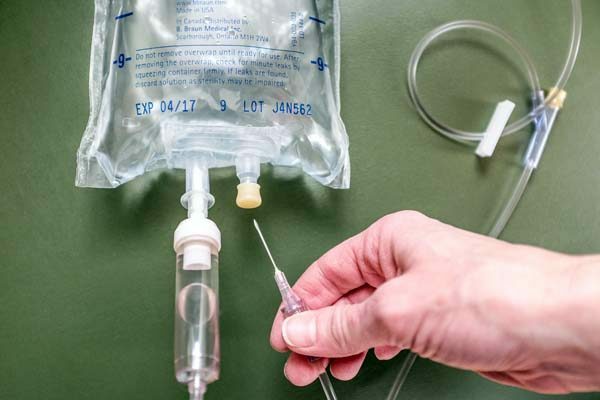 You rehydrate your cat by using a bag of fluids intended for IV use in a hospital, except you administer it underneath the skin, within the subcutaneous area of the body. It’s a lot less complicated than it sounds. If you can throw a dart, you can give SQ fluids. Why is rehydration important? Chronic dehydration within cats’ bodies makes it harder for them to recover from illness. If your cat is being treated for an illness at home, you should discuss using SQ fluids to see if benefit could come from it. 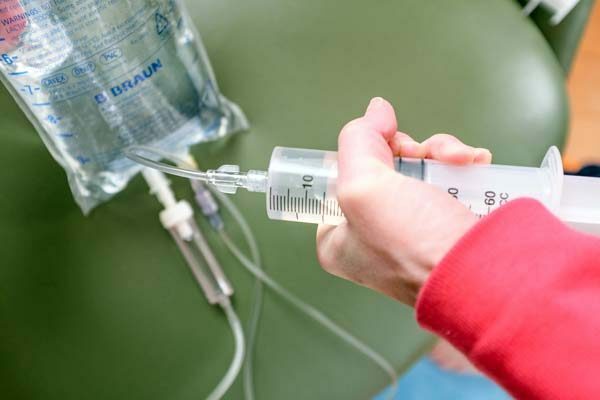 Fluids are the cornerstone of supportive care for so many conditions or symptoms, including chronic kidney disease, pancreatitis, vomiting, diarrhea, fever, and liver diseases. Cats have a greater chance of success against these disorders if they are hydrated. Many cats with these conditions won’t drink enough water or eat enough wet food to hydrate themselves. For others, even though they look like they are drinking a lot, they can’t retain all the water they have consumed. These cats can benefit from this technique. Here’s how to give SQ fluids in nine steps. Consult your vet first to see whether giving fluids is okay for your cat. Make sure there is no reason you can’t give SQ fluids safely, such as unstable heart disease. You also want your vet to go over your plan for how much and how often to give them. The amount you give is determined by a cat’s body weight, and what specific issues he or she are facing. See this guide for how I figure that out and keep things safe for my own patients. When you get home with your bag of fluids, needles, and extension set, things might seem overwhelming. Take a deep breath, and just go step by step. This isn’t a medication you are giving them. It’s just fluids, the stuff that they have in their body anyway. If your vet deems your cat can receive these, you can’t hurt him or her by doing this. 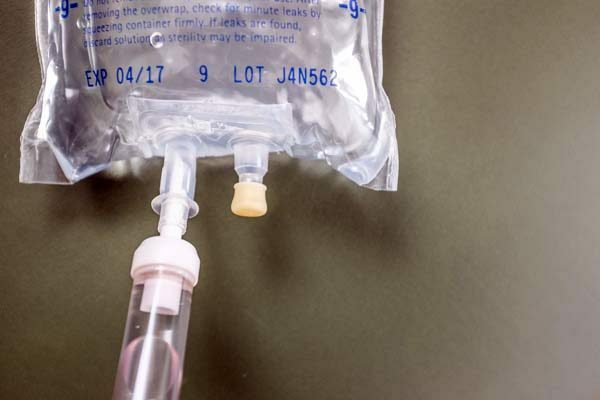 Start by attaching the extension tubing to the IV bag. Remember not to touch the ends with your fingers while doing so. If you do, the setup is no longer sterile because we have introduced germs to the interior of the bag. Same goes for when you attach the needle on the other end of the extension line. Next, flush out the air in the extension line: Over your sink, loosen up all the clips and clamps on the extension line so fluids run free from the bag, through the line and into the needle. Once all the air is out, just reset a clamp on the line to stop the flow. This is optional but can be important. Slightly warm up the bag of fluids if required. Submerging the bag in a bowl of lukewarm water is popular. Talk to your vet clinic to find out how warm to go. You typically just want to take the chill out of it. If you are in any doubt, just go room temperature. Some cats don’t mind if their fluids are room temperature, others really want them warmed. You can also use a microwave to warm up the fluid bag, but ensure no metal parts or needles are attached to the bag when you do so, and that the bag is thoroughly agitated so there are no hot spots within it. Get clearance from your vet first to make sure your microwave will work with the IV set, and that the microwave settings you’ll use will produce the right temperature. Every cat and person is different. Some cats you can administer fluids to by yourself. For others, its a two-person job. Some cats need to be confined to a small box with some towels they can snuggle. Sometimes Zack is patted by my daughter when we give him fluids, or she is playing in the room, offering some sort of distraction. For some, treats and praise will go a long way. Tuna water is a good idea to keep a cat occupied. Sometimes you can spray Feliway (a pheromone that can help keep cats calm) within the room. 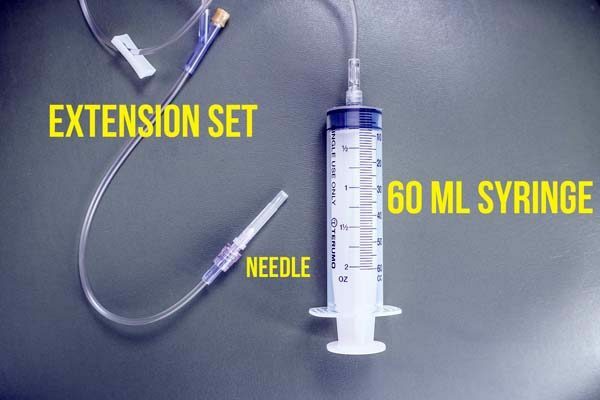 Some prefer large-gauge needles that let you get fluids in fast, while others might prefer a smaller needles. It can be a trial-and-error process to figure out what works best. We learned from Zack over a period of weeks. Don’t give up if it doesn’t go smoothly your first couple of tries. Grasp down with your hand over the cat’s scruff and gently pull the skin up. Because it looks like a triangle with a space in the middle, it’s called the tent. There isn’t a good or bad spot to use — but the bigger the tent, the better. See this area that I’ve drawn with the triangle? That is the space that the needle and fluids go in, called the pocket. You can press your finger in there. Point downwards, bevel up, and insert the needle. 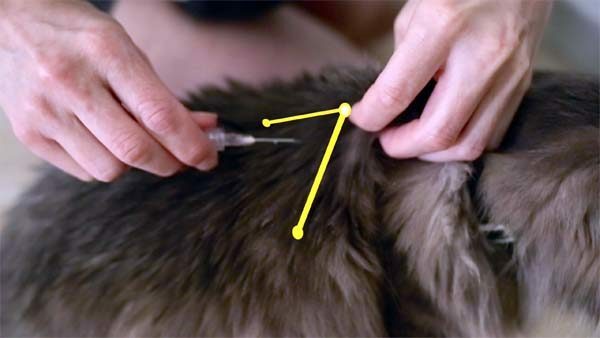 It’s sharper and more comfortable for cats when you position the needle that way. When you insert the needle, really push it in. Don’t just gently scratch them back, which will irritate them. Use a firm, gentle push. Some cats will not react at all. Some might look around, vocalize once, or be grumpy, but they’re won over with some attention or treats. Usually we don’t recommend fluids to be done at home if your cat gets overly upset (biting, hiding for most of the day, becoming fearful or fractious). We do have cats who regularly come into the vet clinic to receive fluids when they required them. The cats and people are happier this way. 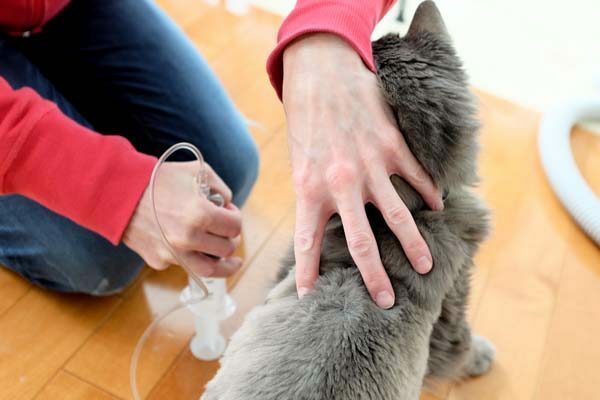 The fluid bag should be suspended high enough and/or squeezed with your hand so that gravity and pressure allows the fluid to enter your cat. You know your needle is in a good spot if there is a nice even flow coming out of the IV bag. 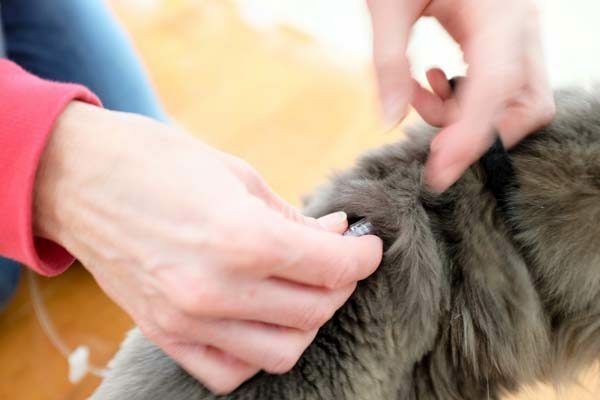 If your cat squirms or if the fluid comes out drop by drop, gently move the needle back and forth, or side to side, until your cat is more comfortable and the fluids come out faster. You can massage the growing fluid lump with your hand while you administer — it doesn’t hurt a cat to touch that area. When you have given the required amount, remove the needle, and place a fresh needle on the extension tubing, thereby ensuring the whole apparatus stays clean. 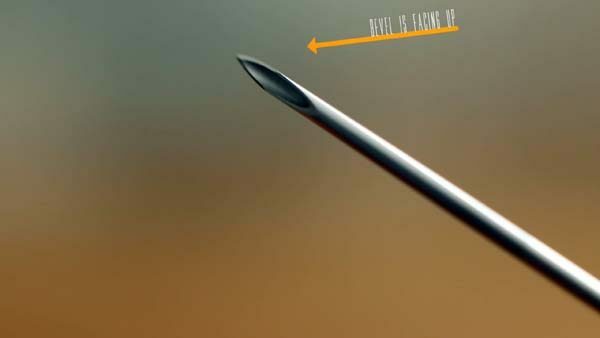 You can use this freshly installed needle to give the next dose of fluids. Dispose of the old needle safely. What if the needle falls out at some point? Well, you’ll join the club of us who regularly have saline on the kitchen floor. It cleans easily of course. Just put on a new needle and keep on going if you didn’t get it all the fluid. What if I see blood leaking out? It’s normal to see some tea-colored fluid (a small amount of blood mixed in with some fluid) leaking from the little lump. It’s okay, and it doesn’t hurt them. What if that fluid lump doesn’t go away within six hours, or my cat looks ill afterwards? 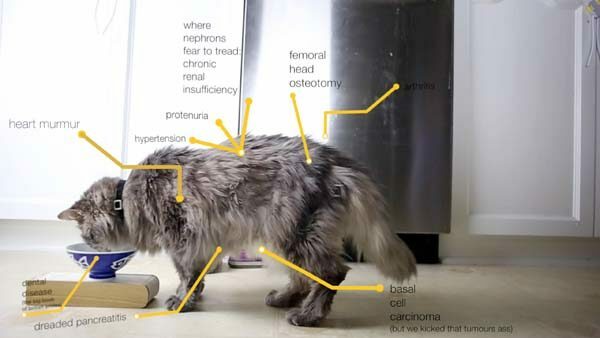 Your cat needs a different amount of fluids, or has an underlying issue that needs to be diagnosed at your clinic. Again, giving SQ fluids can be a trial-and-error process, but remember two things. 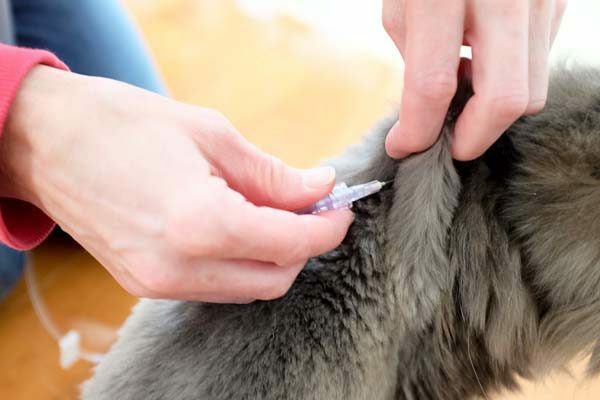 First, you can’t hurt your cat with the needle by inserting it subcutaneously. Second, it won’t go perfectly every time. Some sessions will be more successful than others. The cat is learning. You are learning. But by giving those fluids, you are part of a group of people who can see their cats live longer and healthier despite illness. Just like Zack and his assortment of issues. Always check with your vet before administering any treatment or following any advice you read on the internet. See this video for more hands on instruction for giving SQ fluids. All photos courtesy Dr. Kris Chandroo. About the author: Dr. Kris Chandroo is a veterinarian who lives in Ottawa, Canada, with two little humans, a big horse, 30-year-old turtles, and a cat. 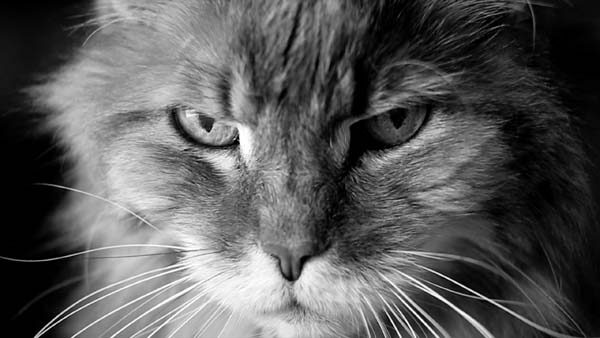 He shows specific techniques designed to help cats live longer, and writes regularly at I Will Help Your Cat. Sign up for his newsletter and follow Dr. Kris on Instagram.